PROVIDENCE, R.I. — Destanie Matias is deep into trigonometric ratios, reviewing the concepts of elevation and depression before she prepares to take a unit test. Hovering over her left shoulder is her math teacher, Maeve Murray. The two are conferring quietly in a spacious computer lab, home to 50 black desktop machines, about half of which are being used by students. But they might as well be alone. Nearly everyone is wearing earbuds, focused on their own screens. Murray and Destanie discuss whether the 16-year-old feels prepared to take the online test. Murray has been monitoring Destanie’s progress via a tablet she carries with her, so she knows her student has mastered the material. But the timing is up to Destanie. They agree that Destanie will take the test after lunch. When she does, she will be the only student to take that particular test on this particular Friday. In fact, that’s the whole point of Destanie’s school, Village Green Virtual, a public charter school in Rhode Island that opened in September 2013 with a mission to “personalize instruction” for every student. 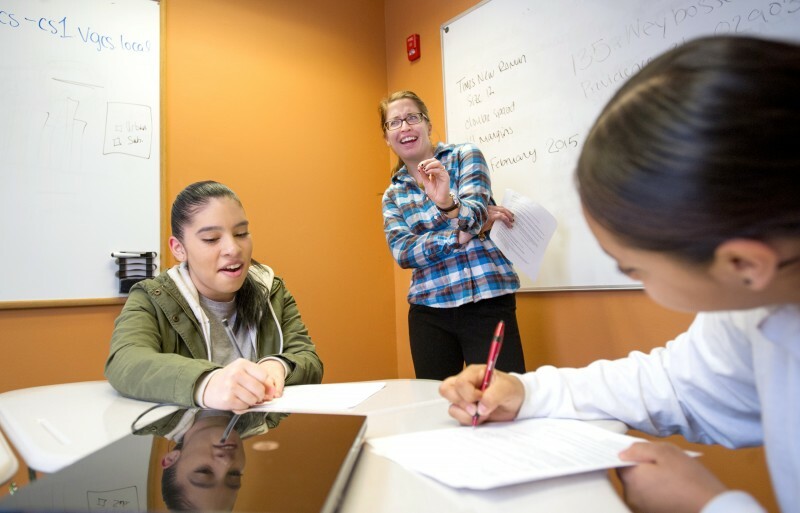 Village Green is at the forefront of Rhode Island’s bid to expand “blended learning,” a combination of online courses with teacher-led classroom instruction. The tiny state has set out to be the first in the nation to integrate computer-based education into all of its 296 public schools. Being a pioneer is a high-risk endeavor. And it’s messy. 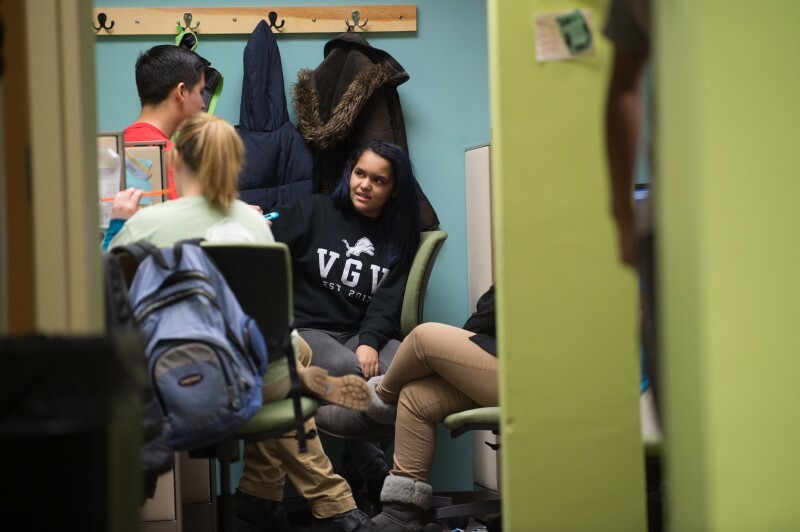 After some flawed assumptions in its first year, Village Green has already made a number of changes to its physical layout, class schedule and staffing. The faculty, students and parents know that their school is being scrutinized by education officials, teacher union leaders and school districts, both within Rhode Island and beyond. 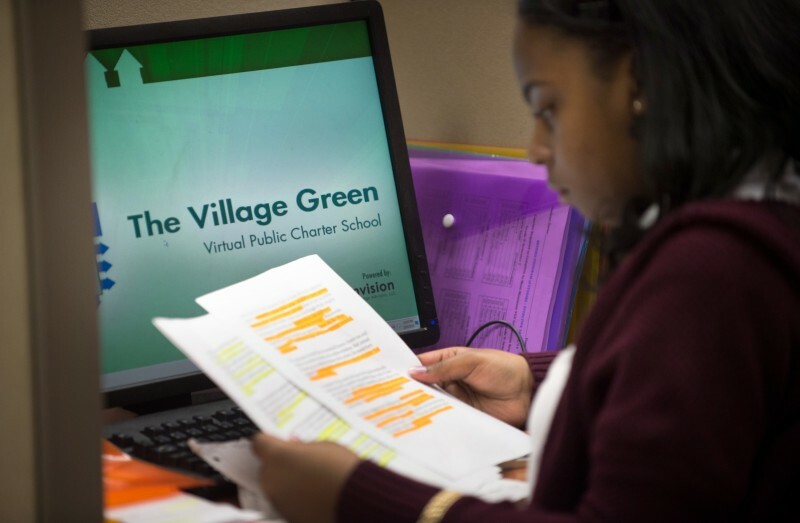 As data on student learning accumulates with the school’s growth, Village Green’s performance will serve as either an exemplar or a cautionary tale, as more and more schools in Rhode Island — and across the country — embrace blended learning. When Robert Pilkington, the school’s founder and superintendent, pitched the Village Green Virtual concept to the Rhode Island Department of Elementary and Secondary Education, he thought the school would emulate Carpe Diem, a blended learning charter school company that operates schools in several states. But after he and Rochelle Baker, Village Green’s chief of operations and admissions, visited a Carpe Diem school in Indianapolis, they changed their minds. “We saw what we didn’t want,” Baker said. They were turned off by Carpe Diem’s teacher-to-student ratio, which ranges from 1 to 35 to 1 to 50, depending on the school. Village Green copied Carpe Diem’s bullpen layout for student workstations, its use of Edgenuity, a computer platform that provides the online subject matter and video lessons, and an office-style atmosphere. But Village Green’s teacher-student ratio is 1 to 12. Midway through the school’s first year, Pilkington had to hire three more teachers. He’d underestimated how much shepherding and one-on-one attention the students needed, and quickly found the 1 to 17 ratio he’d budgeted for was insufficient. 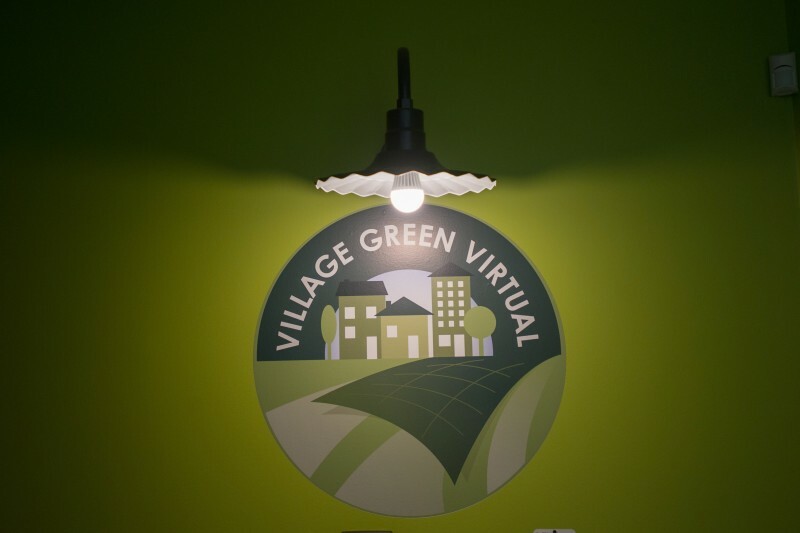 Village Green Virtual looks and feels nothing like other high schools in Rhode Island. 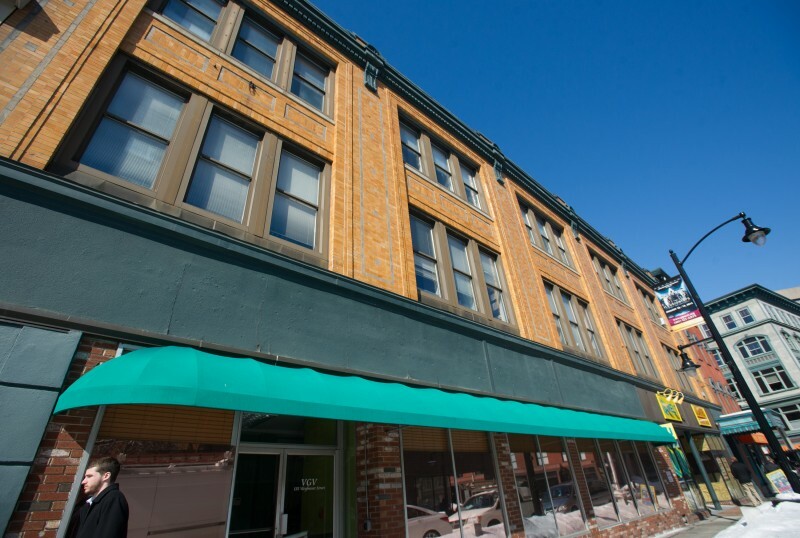 Wedged between a convenience store and a burrito shop, the school occupies four floors of a narrow office building in downtown Providence. 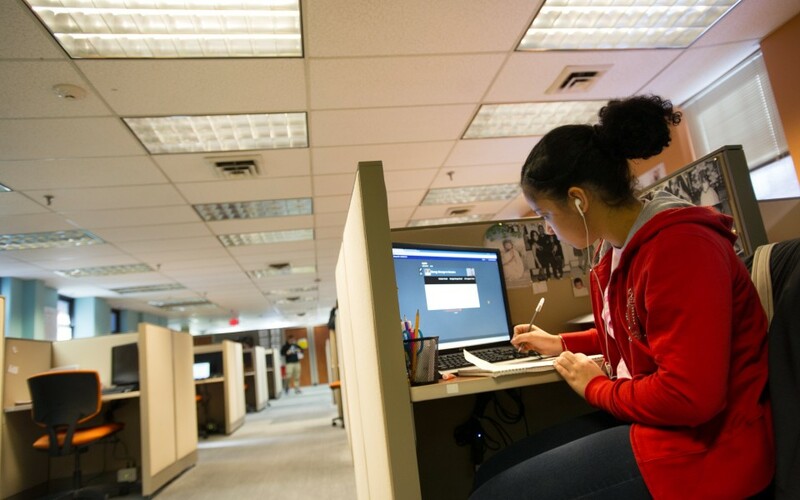 Instead of classrooms, students spend most of their day working independently in computer labs, each workstation separated by a low partition similar to those found in insurance or financial companies. 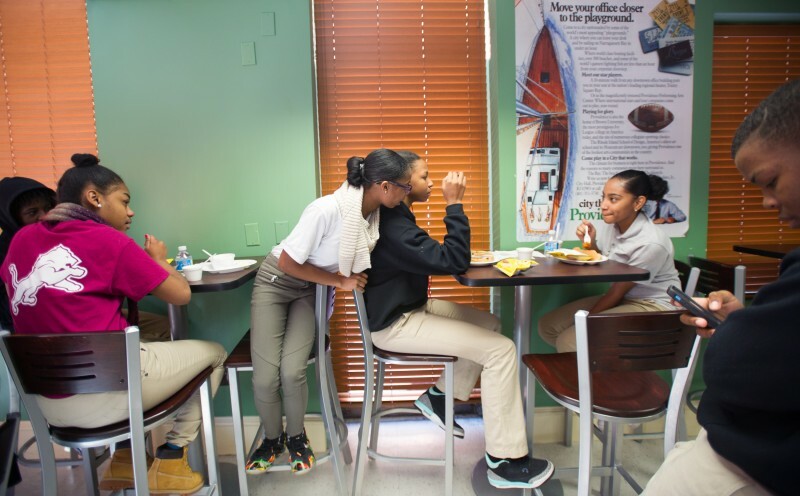 Instead of a cafeteria, students eat in “Hot City Café,” a corporate-style lunchroom. The school assigns no homework and allows students to select the subjects they wish to study online each day. Schools across Rhode Island are exploring various elements of digital education. Students on remote Block Island can now take a wider array of Advanced Placement courses online, and Chariho Regional School District redirected funds this year in order to provide every student with a laptop. Several schools are trying “flipped classrooms” in which students watch video lessons at home and teachers use class time for discussions and projects. But Village Green is the first public school in Rhode Island that is designed expressly for blended learning and uses this approach throughout the entire curriculum. Guiding the experiment, according to school leaders, is a steady stream of data on student performance. This is generated by Edgenuity’s computer platform. For example, teachers, students and parents can log on to their laptops or tablets and see exactly how much progress a student has made in Renaissance history, or whether a student has ignored a poetry unit for too long and needs some prodding. By monitoring student work day to day, hour to hour, even minute to minute, teachers can help students stay on track and can quickly intervene if they are struggling. Just as Destanie was the only student to take that particular trigonometry test that particular day, no two students at Village Green follow exactly the same path or progress at precisely the same pace as they work their way through the curriculum, which is aligned with the new Common Core standards adopted by most states. Demographically, Village Green is diverse. Any high school student in the state can apply by lottery, and the school, although only in its second year, currently has a wait list of 302 students for just 166 places, according to Pilkington. 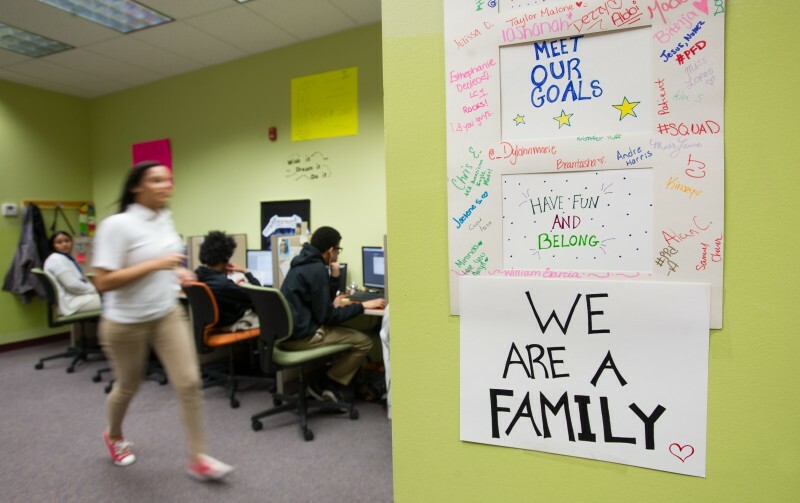 This year, 73 percent of Village Green’s students come from urban districts and 85 percent are eligible for free or reduced lunch, an indicator of poverty. The ethnic breakdown is 58 percent Hispanic, 27 percent black, 12 percent white and 3 percent Asian. 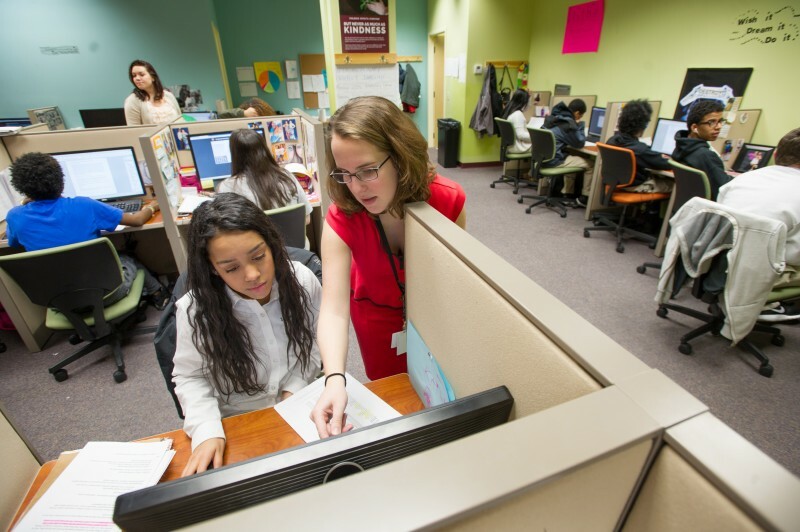 Some students come from among the highest-performing suburban districts in the state and travel nearly an hour each way to downtown Providence. Village Green’s administrators hedge when asked how many ninth-, 10th- and 11th-graders make up each grade. (When this year’s juniors become seniors and a new ninth grade enters in Fall 2015, the school will reach its full capacity of 230 students.) “We have some 10th-graders who are taking 11th-grade math and are finishing up ninth-grade English,” Butler said. “Our system is proficiency-based, so our students are at various places, and it changes all the time.” School officials say they expect some students will complete the four-year curriculum in three years, while others might take five. Such flexibility is one of the benefits of blended learning, say supporters, who include Rhode Island Education Commissioner Deborah A. Gist, (who is expected to depart for the Tulsa superintendent’s job later this spring). This year, students spend 60 to 70 percent of their school day in a learning center and the remainder in workshops. Students are grouped according to where they are in the curriculum in a particular subject and attend two workshops a day that last 30 to 40 minutes each. Teachers who are not busy facilitating a workshop remain in the learning centers, answering questions, tracking student progress on tablets and working one-on-one with students. Last year, the schedule was looser. There were fewer workshops and teachers didn’t always ask students to produce handwritten notes to show they were prepared. School administrators also changed the layout of the computer labs and small classroom spaces. This year, no group has to travel more than a few feet to get into a workshop, after teachers complained they were losing too much time traveling up and down the stairs. 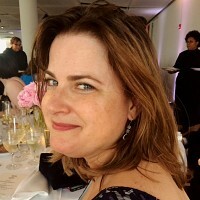 There have been other changes. The school hired a reading specialist this year to bolster the literacy skills of students, many of whom read below grade level. The school also switched to Rosetta Stone for foreign language instruction this year. 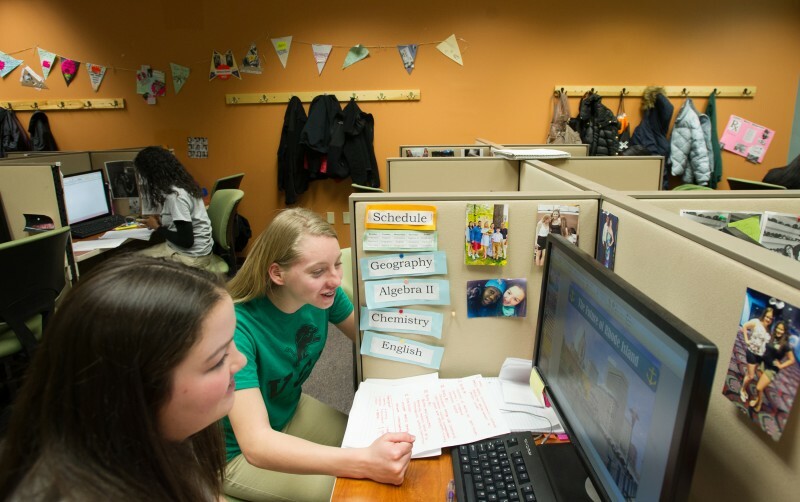 Officials from Edgenuity, which is used by one million students across the country, said they are in constant contact with Village Green, helping staff interpret student data and identify areas for improvement. Village Green hired a data analyst this year to help teachers track student progress and create reports for parents. For a school so reliant on technology, Village Green’s faculty members say they don’t spend a lot of time thinking about it. Nor do teachers and students need to be particularly tech-savvy to do well at the school. Unlike some digital-learning initiatives, Village Green does not give each student a personal computing device. School administrators say that approach causes too many headaches and can be expensive. 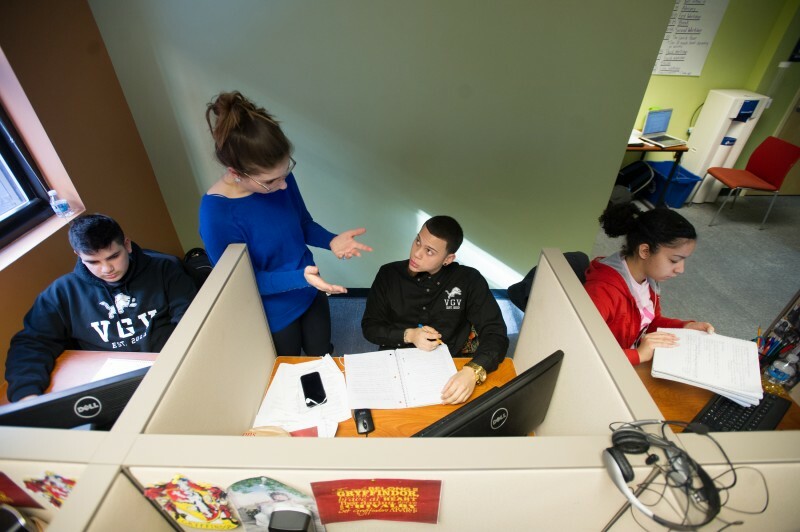 Instead, the machines used by the students at Village Green are “thin client” desktops, which means they have no hard drive and are connected directly to the school’s large server on the first floor. The school has a contract with a local computer company, which blocks popular social networking sites such as Facebook and Twitter that could distract students. The company also provides nightly cleanup and backs up the system. At the end of last year, school officials said their technology replacement costs were negligible; they only had to replace a couple of keyboards. Related: Can a school district’s technology program lift a rural Alabama town out of poverty? But making a school ready for blended learning requires a hefty up-front investment in infrastructure. The school received a $250,000 grant from a portion of Rhode Island’s Race to the Top federal funding in order to reconfigure the school building to accommodate the learning center and workshop format. Village Green also tore down ceilings and installed 260 wires that run throughout the building and ensure a speedy connection from the server to the desktops. The school had to install air conditioning to keep the room where the server is located cool and dry. This “thin client” strategy has helped to keep costs down to about $14,000 per student (the average per pupil cost in Rhode Island is $15,740), and avoided problems such as software viruses, computer crashes and missing laptops, said Butler. “We have not lost one instructional day due to technology,” he said. The function of organelles in plant cells. Simplifying exponential functions in radical bases. The artistic achievements of the Renaissance. It’s 12:44 p.m. on a recent day at Village Green Virtual. Three sophomores sit in a row at their workstations, intently focused on their lessons: one is studying science; another, math; and yet another, history. A few rows over, a couple of students laugh over a video on YouTube. They quiet down quickly and pull up their Edgenuity home-page screens as a teacher wanders over. A few minutes later, 10th-grade social studies teacher Kevin Cordeiro gathers seven students into a nearby classroom for a workshop on American colonial history. His goal today is to get them excited about a persuasive writing assignment. He has props. Cordeiro displays two plastic swords he hopes will inject some fun and help the students grasp key concepts in building an argument: attack, block, counter and evade. The question: Were the Founding Fathers justified in declaring independence from Great Britain? “This is hard to master, but I don’t want you to be timid or afraid to take your stand,” he says as he hands one of the swords to a young woman. The two adopt an adversarial stance in the middle of the small room, each brandishing a weapon. “We have to establish which side you are arguing,” he begins. After the class, Cordeiro said he and his colleagues have struggled with the format of the workshops, and whether they should use the laptops in the classrooms. With the sword exercise, Cordeiro said he was trying to make constructing a persuasive argument seem less analytical and intimidating. Village Green’s reliance on an online curriculum comes with some built-in limitations that even the most creative teacher cannot easily overcome. At a time when many schools and businesses are emphasizing the need for high-quality STEM education — science, technology, engineering and math — Village Green has no science lab. Students must take biology, chemistry and physics online, and watch chemical experiments and frog dissections on video. “We strive to create science-literate folks, not scientists,” Pilkington said. But he conceded that building a science lab may be in the cards down the road, and he recently negotiated the use of lab space at a nearby school so that Village Green students can experience hands-on science experiments for the second half of the school year. Village Green received a physical education waiver from the state Department of Education, so it does not have to provide active gym classes. Instead, students take an online health class that fulfills that requirement. And, like many other small schools, Village Green does not offer sports or many extracurricular activities. Under state law, charter school students are allowed to participate in after-school athletics in their home districts. Few Village Green students take advantage of this provision. However, the school has a yearbook club and a student government and holds dances. For some students and parents, it seems the trade-offs of being part of an educational experiment in a small school are worth it. Andrew Szurley, whose daughter, Maddie, is a sophomore, believes she is benefitting from the school’s small size and the diversity of the student body. The Szurleys live in Lincoln, a nearby suburb with a well-regarded school system. But the option of an alternative high school model for Maddie appealed to the Szurleys, and the family decided they were willing to take the risk. Szurley is pleased that Maddie has more contact with her teachers this year. But he remains concerned about the lack of hands-on science experiments he enjoyed in high school, and wonders at times just how challenging his daughter’s online courses really are. Still, he said that, so far, his family has no regrets. And Pilkington’s view — that Village Green Virtual’s primary focus is not technology but rather creating a new, highly individualized learning environment — rings true for Andrew Szurley. This story was produced by The Hechinger Report, a nonprofit, independent news website focused on inequality and innovation in education. Read more about Digital Education.